Borghese is a brand of polish that retails pretty high in drugstores. They are usually around $8. To be quite honest I have not been entirely impressed with them. It's something about their formula. It seems to drag on my nails after I've done one coat. It doesn't apply as smoothly as I would like. I've also had some high expectations with some colors that didn't turn out as nice as I would of expected. The price that they're sold at and the experience I've had with this brand is disappointing to me. This is just me though. I'm sure there are others who love this brand. Rossi Apple is a deep pinky/red shimmer. Meh. I don't have much to say about this. It's not very original. I wanted to like this because it is more a pink/red for the fall season. It's a pretty color, but it doesn't wow me. I feel like it's way too "blah". I don't know if I feel this way because the shade is really "blah" or I'm just becoming more picky with colors. I have lots of reds and pinks, so I always look for something I don't have. I suspect this why I'm not thrilled with this one. It looked cool in the bottle, but on the nail it was just yawn worthy. It's very "been there..done that"! 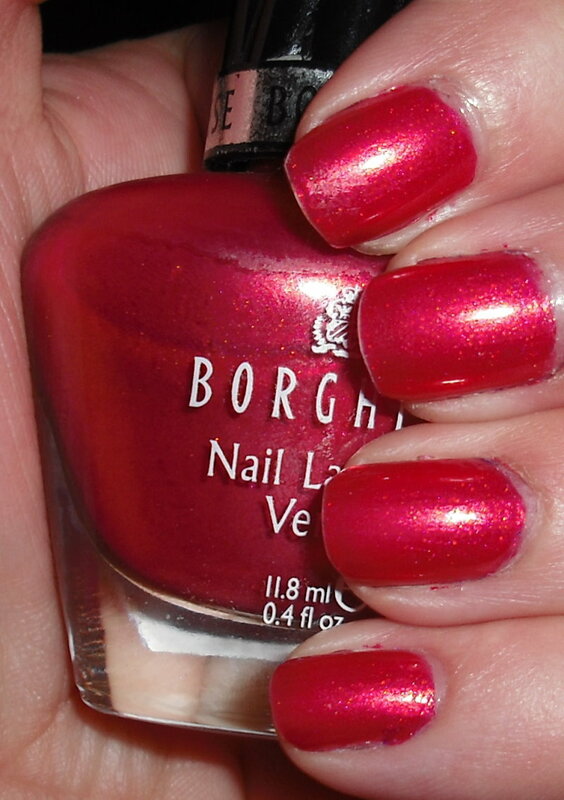 What do you think of Borghese polishes? Any favorites? Hrm...I feel ya. The color isn't bad, but it doesn't thrill. I don't own any Borghese because I think they retail too high for drugstores...and for some unknown bottle snob reason, find their bottle shape ugly (strange, i know!). I saw some older ones at Ross today. I was going to get about 4 and they were $2 each. I thought it would make a nice Borghese giveaway. But the line was so long and so slow, I left. Have you seen the Stellar Noire color? I've seen it mentioned and swatched by a few bloggers. It's a pretty dark duochrome. Otherwise, they don't have a whole lot of colors I'm crazy about. Borghese just seems so nice though, for some reason! This colour is very pretty, although I suppose you are practical and right in saying the colour is very unoriginal. I finally bought a couple when they were BOGO free. I was also unimpressed, I won't buy anymore, even at 1/2 price. i have quite a few of them but haven't used them as often as i would like. they always seem to be the last one's i got to. not sure why but they are.... stellar notte if very beautiful but there is a dupe, can't think of the name right now? i forgot to tell you how lovely your blog is. i gave you an award! I've never heard anyone say they really like Borghese. Just Stellare Notte, because it really is a cool duochrome. All the rest are meh. Sometimes they come out with some interesting limited editions, but it was funny, the last collection had mattes mixed in with normal and I saw that a lot of bloggers were shocked and confused by the matte polishes and didn't know that's what they had bought. I just got a normal red glitter from that collection for a Christmas mani, looks like any other Ruby Slippers/Pumps polish, but I don't have any of the others, since it was BOGO and I picked it up with Stellare Notte.